We all have certain foods, tastes and smells that take us back. There are so many foods that bring back smiles and memories for me. If there’s one meal (ok – there’s a whole slew of meals) that makes me think of my Polish Grandmom it would be stuffed peppers or stuffed cabbage. She made both of them often. They were cheap, hearty and filling meals. 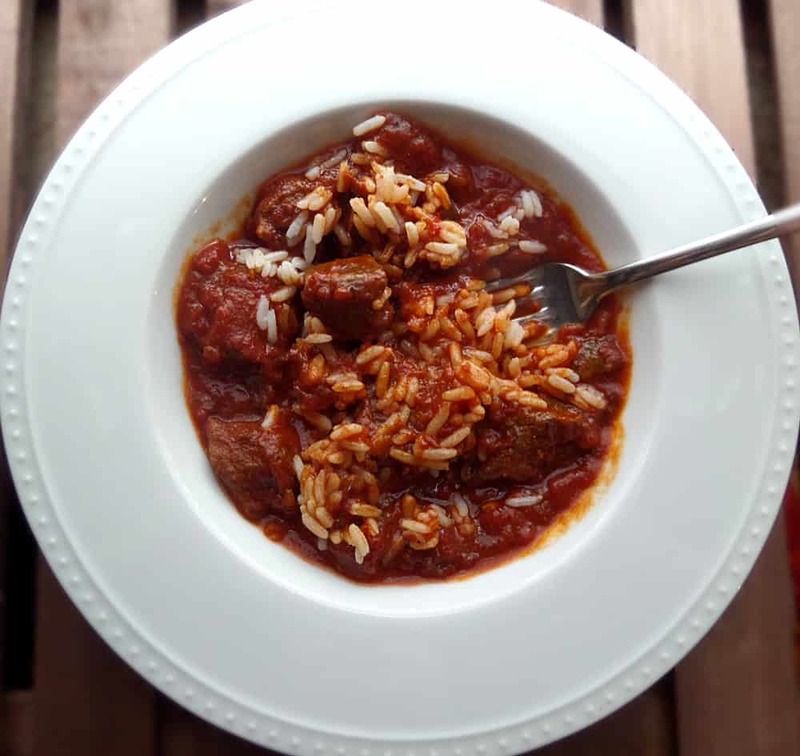 Green peppers, beef, rice and tomato sauce – that combination, in any form, makes me think of my Grandmom, Halina. This is a simple meal, nothing complicated. It involves minimal prep work followed by two hours of simmering. Plan ahead to get an early start on it and it’ll make a great and easy dinner any night of the week. After 2 hours of patience you will be rewarded with delightfully tender beef. 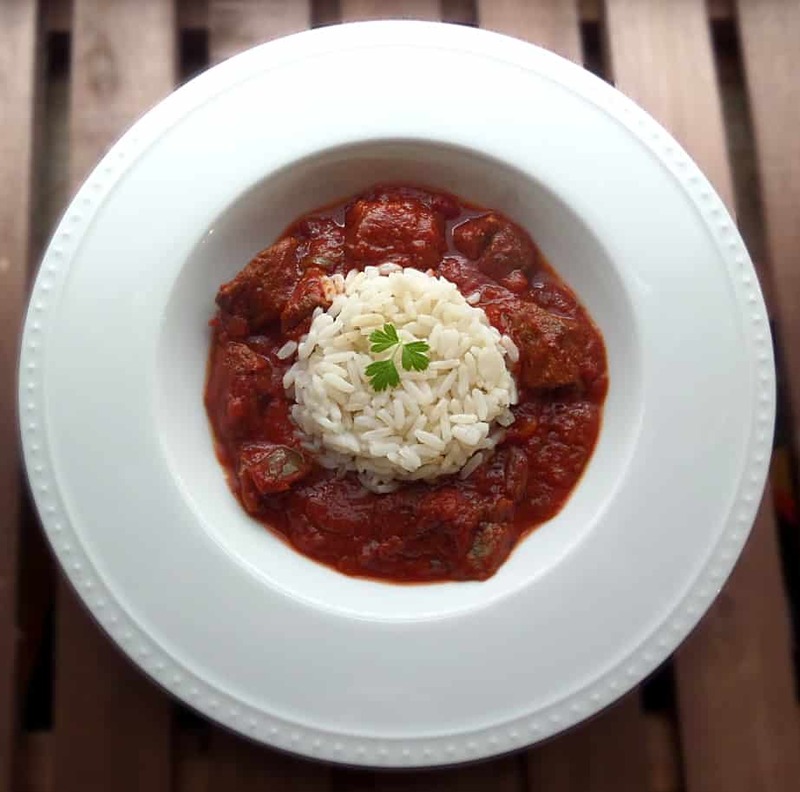 Serve a big saucey spoonful over a bowl of rice. This meal is perfectly hearty and delicious. 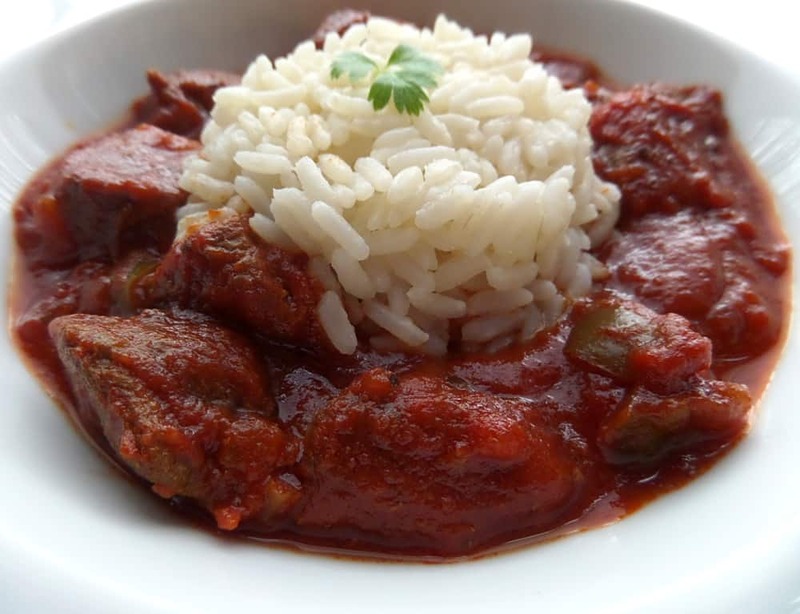 Tender beef cubes with green peppers braised in tomato sauce. Heat oil over medium/high heat in a large skillet or dutch oven. Add beef cubes and brown on all sides. Set aside. Add onions and saute until a caramel brown. Add garlic, saute for a minute. Add green peppers, tomato sauce, crushed tomatoes, paprika, salt, basil, chili powder, pepper, oregano and beef. Bring everything to a bubbly boil, stirring continuously. Reduce heat to low, cover and simmer, stirring occasionally, for about 2 hours or until beef is tender. Salt & pepper to taste if necessary. Serve over rice. Hi there – YG stopping by to tell you this dish is wonderfully warm and comforting. I love the ingredients you used today to make up a dish that looks so tasty and elegant yet hearty! Love this recipe so much, was wondering if the cook time changes if I substitute the beef cubes with pork cubes? Hi Rebecah. The cooking time should be about the same. Will red bell peppers be good instead of green?